Its story may add nothing new to the horror thriller genre, but Greta manages to thoroughly entertain with a fantastically devious performance from Isabelle Huppert, and beautiful artistic merit from director Neil Jordan. What is a knowingly schlocky horror at its heart, is treated with meticulous care by Jordan as he creates a dichotomy of high-class trash. Not quite on the level of his previous works The Crying Game or Interview with the Vampire, Jordan still provides an elegant cinematic voice to an otherwise clichéd premise. The typical stalker thriller theme is slightly subverted, taking a premise usually reserved for romantic storytelling and making it about a surrogate mother figure. 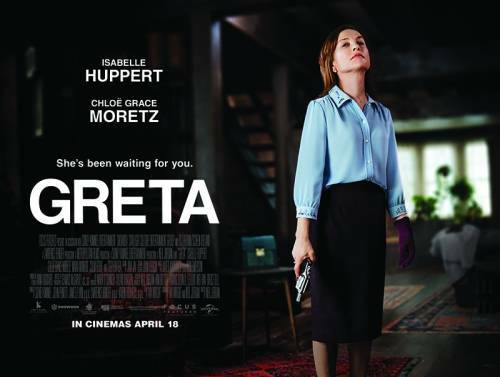 Isabelle Huppert plays Greta, an older lonely woman who befriends the younger Frances (Moretz) who feels sympathy for a woman who’s been widowed by her husband and abandoned by her daughter. Greta’s not as innocently lonely as she at first seems, and as the truth comes to light, Frances tries to pull away as Greta gets more and more aggressive towards her. Huppert gracefully plays the sinister stalker figure with joie de vivre, but with a deadpan seriousness which makes her scenes simultaneously hilarious and ominous. A scene where she is standing perfectly still outside of Frances’ place of work from day until night evokes a laugh from the audience while also giving them chills. The film knows that the stereotypical horror tropes have been so overdone by this point that it’s just funny, and Greta plays well into this humour. High camp, high art, and high tension fill the screen. The combination of Huppert’s mischievous performance and Jordan’s handiwork with a camera elevate this film, which often feels like an homage to 90’s thrillers. The musical score saturates the 98-minute runtime, telling the audience how to feel; from horror stings to moments of humour. Again, this plays well into the genre’s convention, but to the extreme. The music also gives the film a dreamlike feel, feeding into one of its main themes. All of these tropes dialled up are what make this film a high-class hoot. Even with the elements of humour peppered throughout the film, Greta still manages to be a tense horror experience. There are the typical jump scares, gory violence, chase scenes, and a terrifying claustrophobic incident. In the hands of a lesser director, perhaps even the horror elements wouldn’t have been as effective as they are. The balance between the humour, horror, artful merit and schlock teeters delicately with Jordan in full control. The perfect level of camp meets high art, Greta is a self-aware humourous matriarchal take on the horror thriller genre. Isabelle Huppert is brilliant as always, and much of the film rests solely on her shoulders. Go in with a sense of humour and come out with a newfound or renewed love for Isabelle Huppert. 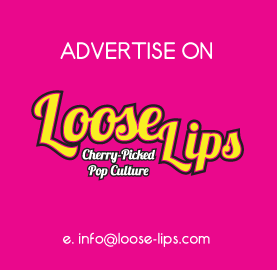 This entry was posted on Sunday, April 14th, 2019 at 7:45 am	and is filed under Features, Film, Review.